Treat the group to this delicious snack or luncheon assortment nestled inside a hand-woven basket specially created, signed and numbered by a local Amana Colonies basketmaker. 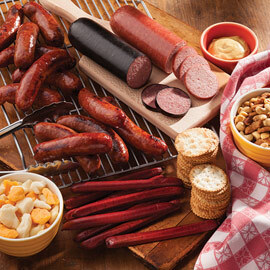 The Picnic Pleaser is ideal for lazy summer days or tailgating parties. I ordered this for a gift. it was delivered on time and my client was very happy with it. I ordered this for my parents, and they absolutely loved it! I can always count on top quality products from Amana. This basket we bought for my boss was so good we had to purchase one for ourselves! This gorgeous basket looked and tasted great. It was the perfect gift! Sent the picnic basket as a 'thank you' to friends in Michigan and they were amazed at the variety and quality of the basket!! Thank you so much for your wonderful products. This is the second year we ordered the Picnic Pleaser for our staff. What a wonderful basket and abundance of treats in the picnic pleaser. All the staff could enjoy the various crackers, cheeses, ssausage and even popcorn! And there is always a drawing for who gets to take home the basket--it is such a great gift! We will be ordering this again next year. Amana Response: Thank you so much! We enjoy putting these baskets together and so glad to hear they are enjoyed.